PURPOSE: To provide guidance in meeting national legislative standards on maintaining the privacy of members, volunteers, staff and students, stakeholders and financial contributors. 1. While we advocate for sharing and generosity, Mullum S.E.E.D. Inc. respects and upholds a person’s right to privacy protection under the National Privacy Act 1988, specifically in relation to the amendments made by the Privacy Amendment (Private Sector) Act 2000 in regulating how we collect, use and disclose and hold personal information. 2. We are committed to the security of confidentiality and we aim to apply best practice to ensure privacy is protected and respected . 3. Personal details will not be shared with other parties without the consent of the relevant individual. 4. Privacy management is a continuous and evolving process and we regularly update our practices to accommodate changes in technology, the organisation’s function and legislation. a. We collect the personal information that it is provided to Mullum S.E.E.D Inc. in a number of ways, such as through membership and volunteer registrations, donations, online enquiries and purchasing merchandise, taking part in an event, applying for services, making a donation to the Bunya Sustainability Fund and in all manner of interactions with Mullum S.E.E.D Inc.
b. Mullum S.E.E.D Inc. may also collect personal information from publicly available sources such as the telephone directory. a. Mullum S.E.E.D Inc. takes reasonable steps to ensure that personal details are accurate, complete and up-to-date when we use or collect such details. b. Any changes to any information previously provided can be made by email, mail or telephone call. a. We do not collect personal information from our visitors other than what is supplied to us on a voluntary basis. b. Mullum S.E.E.D Inc. analyses our website logs to constantly improve the value of the content available on our website. Information in our website logs is not personally identifiable and we make no attempt to link that information with the individuals that browse our site. 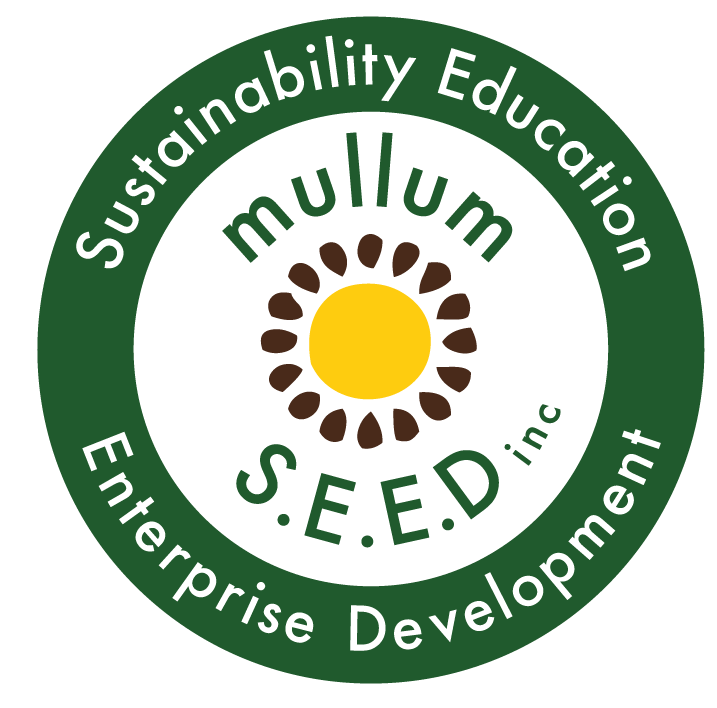 Mullum S.E.E.D Inc. uses Pay Pal to ensure secure commerce transactions. It encrypts all personal information, including credit card number, name and address so that it cannot be viewed by a third party as the information travels over the Internet. a. All hard copy documents containing contact details of members, volunteers, staff and students will be kept in locked filing cabinet in the office. b. All electronic documents containing contact details of members, volunteers, staff and students will be protected with a password known only to Board members and authorized co-ordinators and staff. c.. If any document or information of a confidential nature is seen by someone other than authorized personel, the person whose information has been exposed, must be informed ASAP. a. Our contact lists are emailed a monthly newsletter and weekly updates of activities and events. b. On occasion we may inform our contacts of updates on special campaigns and activities. c. If a person would rather not receive this information, they will contact Mullum S.E.E.D Inc. via email or mail. We will offer opportunities to OPT-OUT of receiving communications from Mullum S.E.E.D Inc. and we will ensure personal details are excluded from all internal communication and marketing lists and future campaigns. d. Individuals may be contacted regarding receipts and reimbursements of expenses when necessary. a. The email addresses of members , volunteers, staff and all contacts will be BCC’d in all general group email correspondence. b. Members of pods and projects will be asked to agree to for their contact information to be shared amongst the group for CC’ing communication amongst their specific group. b. As a part of their position agreement, Pod leaders, co-ordinators of authorized activities, teachers and management committee members will agree that their supplied contact details are open to access to all members and volunteers. Request for contact details of members, volunteers, staff and students by other members, volunteers, staff and students will be referred to the relevant individual. c. Mary will supply her email or phone contact. d Joan will be contacted by authorized personel and advised to contact Mary.